Where this knowledge is located, e.g. in the mind of a specific expert, a specific department, in old files, with a specific team, etc. In what form this knowledge is stored e.g. the minds of experts, on paper, etc. How to best transfer this knowledge to relevant people, so as to be able to take advantage of it or to ensure that it is not lost. E.g. setting up a mentoring relationship between experienced experts and new employees, implementing a document management system to provide access to key explicit knowledge. The need to methodically assess the organization’s actual know-how vs the organization’s needs and to act accordingly, e.g. by hiring or firing, by promoting specific in-house knowledge creation, etc. Alan Frost, KnowledgeManagementTools.net at http://www.knowledge-management-tools.net/, http://www.knowledge-management-tools.net/knowledge-management.html, and http://www.knowledge-management-tools.net/why-is-knowledge-management-useful.html, accessed 19 October 2017. 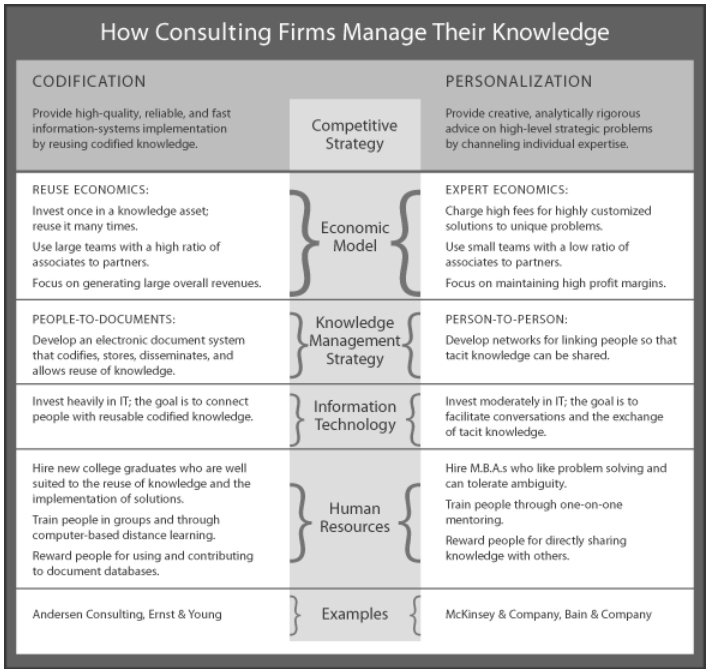 Morten T. Hansen, Nitin Nohria, and Thomas J. Tierney (1999), What’s Your Strategy for Managing Knowledge? Harvard Business Review, March-April, at https://hbr.org/1999/03/whats-your-strategy-for-managing-knowledge, accessed 19 October 2017. Page created by: Ian Clark, last modified on 19 October 2017. 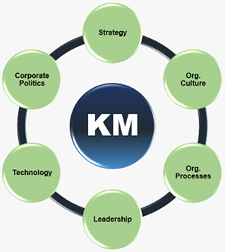 Image: KnowledgeManagementTools.net at http://www.knowledge-management-tools.net/, accessed 19 October 2017.